Nationally, the figures on accidents taking place between cyclists and automobiles and pedestrians and automobiles are grim. The figures for pedestrians are even more stark. The NHTSA reports that 4,735 pedestrians were killed in 2013, and 66,000 injured. Every 2 hours through the year, a pedestrian was involved in a fatal collision with a car, and every 8 minutes, a pedestrian was injured. The conclusion is obvious. While both cyclists and pedestrians need to exercise caution in their interaction with vehicles, vehicle drivers need some tips on sharing the road with cyclists and pedestrians, to increase their safe driving vis-a-vis cyclists and pedestrians. First, realize the comparative vulnerability of cyclists and pedestrians. You are encased in several tons of metal. Cyclists are riding on relatively flimsy vehicles—and they are very open to injury and being thrown from the bike. Even if they’re wearing a helmet, they are still no match for a car. Pedestrians are even more vulnerable, because they are highly unlikely to be wearing protective gear. Drivers have a tendency not to fully focus on either cyclists or pedestrians. Why? They are focusing on cars, of course. Cyclists may be seen as a kind of background distraction on the side of the road. Pedestrians might be seen as an impediment to fully flowing traffic. Do not fall for this trap. Both cyclists and pedestrians have as much a right to the roads as you do. Both cyclists and pedestrians have rules of the road to follow, just as you do, as well. Cyclists, for example, should ride in the same direction as the traffic, not against it, and follow traffic signals. Pedestrians should always wait for a cross-walk or a designated signal to cross. We all know, though, that these rules are not always followed. If they’re not, don’t insist on your rights of way. Yield for both cyclists and pedestrians as part of defensive driving. You don’t want a collision with a more vulnerable party to occur. Fourth, don’t drink and drive. 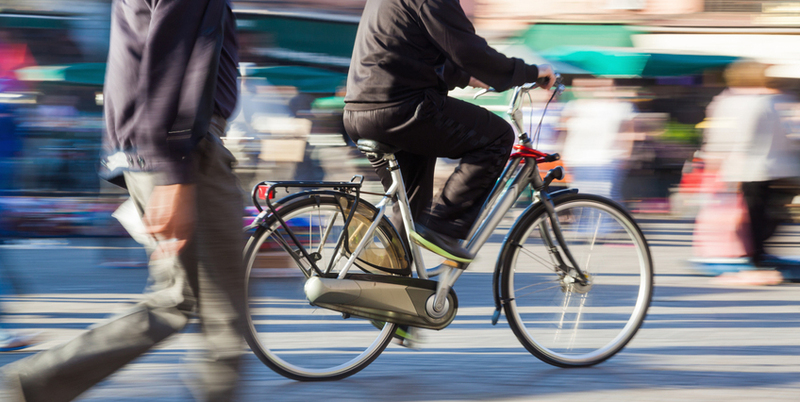 The NHTSA reports that more than a third of fatal collisions between cyclists and car drivers and nearly half of fatal collisions between pedestrians and car drivers involved alcohol. Once you follow the 4 tips above, there are specific tips on sharing the road with cyclists. Watch out at right turns. This is a particularly common place to have a collision; the bicyclist may not notice your turn signal. If they are only slightly behind you, or slightly less than even with you, they may not be able to see it, and drive right into you as you start a turn. Defensive driving is particularly important here. Watch out at left turns. The most common error here is to think you have plenty of time to turn before the bicycle could hit you. They are vehicles capable of moving very fast. It is not uncommon for bicyclists to be going 20 mph or higher. Make sure you have plenty of time to complete the turn. Leave 3 feet of clearance between you and a bicycle. It makes it safer all the way around. Nearly half of U.S. states have mandated leaving such a space. Look before you open your door. This is a big site of accidents as well—a driver opening a door directly into the path of a cyclist. Traffic safety is everyone's responsibility. By following these tips, you are ensuring that you, cyclists, and pedestrians are as safe as possible on the road.